The pilots then circled around again and came in for a landing. The giant aircraft touched down on its right landing gear first; after the left gear touched down, Roc appeared to swerve several times as it slowed to a stop. The landing on the right gear first was reportedly due to a crosswind of about 5 knots that was blowing from the east. Winds from the east are a relatively rare occurrence in Mojave. During a press call, Stratolaunch said the flight lasted 150 minutes during which the aircraft reached a maximum of 15,000 feet and a top speed of 189 mph. Backed by Allen and built by Burt Rutan’s Scaled Composites, the aircraft is designed to air-launch satellites using boosters carried on the wing between its two fuselages. After the flight test program is completed, Stratolaunch plans to initially use Pegasus XL boosters built by Northrop Grumman. Whether the Roc will launch any other rockets is unclear. The company had plans to develop a series of boosters to serve a broad range of customers. However, those projects were canceled in January, three months after Allen passed away from cancer in October 2018. At that same time, Stratolaunch laid off about 50 employees. A small team remained to complete the Roc‘s flight test program and a rocket launch. Allen and Rutan had unveiled plans for the air-launch system in December 2011. At that time, SpaceX was going to build a smaller version of its Falcon 9 booster for the aircraft. However, that deal was canceled and Orbital Sciences (now Northrop Grumman) took over the job of developing a medium-lift rocket. However, that agreement ended as well. Stratolaunch subsequently said it would use Pegasus XL for initial launches while it developed a fleet of boosters. That plan was changed three months ago, leaving only the Pegasus XL. Pegasus XL is a small satellite launcher that is air launched by a modified L-1011 aircraft that parked right down the Mojave flight line from Stratolaunch’s hangar. It is a much smaller booster than Roc was designed to launch. The company has talked about launching three Pegasus rockets on a single flight. Allen’s sister, Jody, was named executor of the estate after her brother died in October. 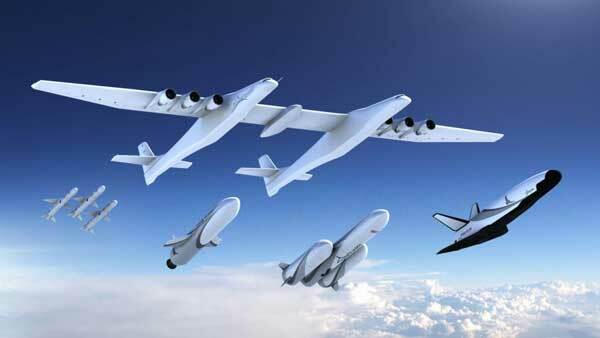 With Stratolaunch, she was faced with a program that was already running years behind schedule and faced major expenditures in developing boosters to fly ion the aircraft. It has looked as if the flight test might have taken place earlier in the week. There were notice to airmen (NOTAMs) posted for Wednesday and Thursday. However, the aircraft never moved from its spot in front of its hangar. Word began leaking out Friday afternoon that a test flight would be conducted the following day. If the goal was to try to keep the flight low key, it didn’t work. The roads around the airport were crowded with spectators to see the maiden flight of Rutan’s and Allen’s massive aircraft. Only a relative handful of people showed up on Wednesday and Thursday. The flight test corresponded with the annual Mojave Experimental Fly-in, a two-day event during which the ramp is full of airplanes. Those who arrived for the festivities this morning got quite a treat watching the plane’s flight. Attempts at crowd control in areas outside the airport fence were ineffective. Just before takeoff, Kern County Sheriff’s deputies arrived at an area where people had gathered beyond runway 12-30. They attempted to clear the area just as the plane roared down the runway –with no success. Later they attempted to clear the area on the other side of the airport where spectators had gathered to watch the landing. The initial effort partly succeeded as some people left. By the time the plane landed, however, the area was more crowded with spectators than it was when the deputies had first arrived. glad to see it finally fly…but what will become of it? Probably it will join the White Knight in the museum he had. It flies. Good. Now what?…Pay $20 per customer for a tour of the permanently grounded beast? I can’t really see the value of it. The value of an air-launch is that you can take off from any airport rather than needing a dedicated launch pad, and can fly out to the launch window above any bad weather. But this needs a special large runway to take off, and appears to have a rather limited range. Thanks Doug. They might be able to get business. N-G charges 30m$ or so for a mission on Pegasus. So they buy one. 10m$? So they charge 20m$. They might make a profit with all these small sat. Burt Rutan is great at designing homebuilts, drones and one trick ponies like Voyager. But his commercial and spacecraft designs never made any sense, either operationally or in terms of economics. It is sad that the late Paul Allen put so much faith in him, his money could been better invested in startups like XCOR that actually had a good engineering foundation. But that said, Burt Rutan’s designs will be remembered. I haven’t forgotten the t/Space and Scaled Composites collaboration for the air-dropped Quick Reach rocket, which I thought was a reasonably thought out concept for the X prize. As for scalability for a commercial follow-on, I’m not so sure, dependent upon whether a vehicle constrained by the capacity of the carrier aircraft could fly enough passengers for a profitable venture. Of course, now the Scaled Composites Roc is available. I suspect that once the kinks are worked out, the US has a serious new capability to drop or launch some “special” weapons. Those who are discounting this capability I think are wrong. One example would be a 20,000 lb rocket boosted kinetic strike weapon. Theoretically, a “Rod” of that weight traveling upwards of 24 x the speed of sound would direct downwards incredible shock waves taking out most imaginable underground structures. A fragmenting version could lay waste air fields, ports, industrial zones or forward troop positions. Drones could easily extend the range of this bird and provide some protection. The US also has in the works a particle beam weapon fashioned into the shape of a medium sized rocket stage for use in space. The DOD has already warned the US might show this capability as a warning not to exacerbate the weapons race. This aircraft gives the DOD an ability to lift some large objects more efficiently. If this concept is so unnecessary, why is China and Russia pursuing the same dream? Once this prototype is certified and the designs flushed out, a cheaper version can be manufactured. It will be able to launch two large payloads either into LEO or down extremely fast to earth. There are also strategic runways the US has around the world that can land this craft with the necessary chutes and reverse thrust. It may also be possible to fly from shorter runways with some rocket assist. Even if SpaceshipTwo is a “success” in the sense it starts carrying tourists it’s a technological dead end of little use beyond providing short joy rides. And it would need to haul at least 10 times the number who have reservations to even breakeven. It’s the space equivalent of a hot air balloon. I dont know that it will do that…but if it does the world changes. How? The latent demand for such joy flights was always there, but how will it get humanity closer to being a space faring society? Hot air balloons were fun for folks to ride in but they didn’t bring about the modern air age. Who designed the wing/fins for Pegasus? Scaled Composites. Mojave’s runway 12-30 is 12,500 feet long and 200 feet wide – standard for AFB runways that handle heavy bombers. A lot of major civilian airports have at least one 200 foot-wide runway and most are 10,000 or more feet long. Hopefully, the sister, jody, will give this priority as one of Allen’s last great accomplishments. meh. Denver International can handle that easily. 16K’. But wings don’t work that well in a vacuum and are a real hazard on re-entry. Winged rockets are the flying boats of space, a compromise that is not really home in either environment. Yes, it would be very nice for it to get a fair shot at success, but they will need to do better than Pegasus. A quick solution would be to use one of the ICBM cores ATK/Oribtal has for a launch vehicle. The USAF already prove in the 1970’s using a C-5 it was possible to air launch one.